I have noticed one thing I don’t really do, or at least post about: my sketches. This blog, being about my personal art progress, lacks records of me actually practicing. Admittedly, I rounding out my drawings with more finished lines, colour and shading and I like showing off those. I do sketch, but they are more like doodles and to me, it’s kind of embarrassing to show off. See, I’m still comparing myself to every other artist out there. With every drawing I learn something new, even if it’s accidental. Unfortunately, I don’t have a lot of time in the day to draw, so when I do draw, it’s towards a specific purpose. 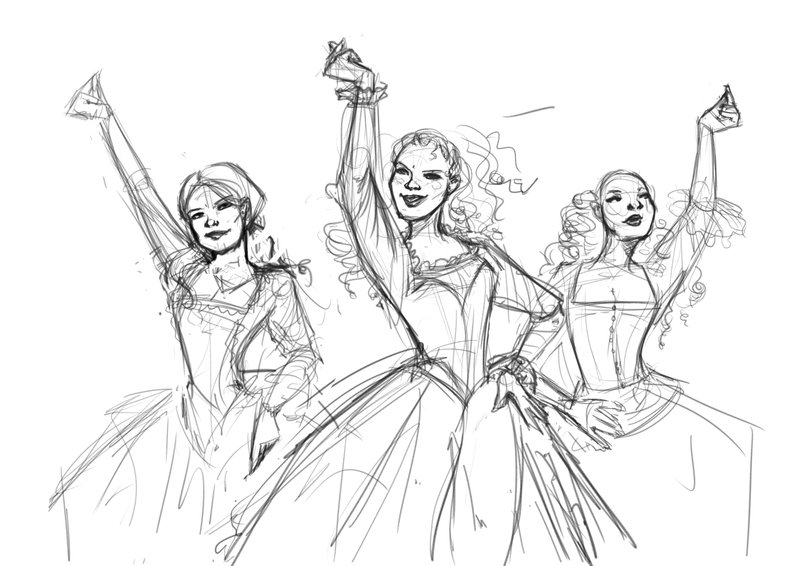 Events of this past week made me want to draw something bright, colourful and positive, and I’ve been listening to a ridiculous amount of Hamilton lately, which is why I chose these ladies for my 2 hour sketch. Except, the sketch ran for more than 2 hours and I kept wanting to finish it like it was meant to be a completed piece instead of a sketch. I spent an additional 2 hours colouring it anyway. Here’s a time lapse of the rough sketch.